**Discontinued kits on sale for 10% off while supplies last. Choose the other premium kits tab on the Young Living site when selecting. They recently swapped out two oils, so this is on the old version. A great deal, but hurry, won't last long. Don't forget to choose member, the only way to get the highly discounted starter kits. We recommend the Premium Starter Kit with 12 oils and a desert mist diffuser. No further obligations. Or read below for more detailed directions and other kit options, including information on Essential Rewards which will give you discounted shipping and $10 product credit on your first order. Wholesale membership, 24% off any of Young Living's over 500 products. Plus, access to monthly promotions, rewards programs and referral income. Plus when you sign up with Oil Fun Club, you get FREE bonus items and a support system to walk you through how to best use your products. You are not required to order monthly nor required to sell. Please ask the person who sent you to this page if you have any questions. CHOOSE MEMBER (you never have to buy again or sell) to purchase a starter kit like the ones below and get wholesale pricing or RETAIL to pay full price and order items individually. ENTER ENROLLER & SPONSOR Replace both the enroller and sponsor number with the person who referred you. Search below for the member number of the person that referred you. Leave the numbers the same if you are not working with someone, and we will assign someone to help you with all our bonus items. CHOOSE YOUR KIT The Premium Starter Kit is the most popular and is over 50% OFF. ADD ANY ADDITIONAL PRODUCTS. The first product we always suggest getting outside the kit is the Thieves cleaner. A concentrate that will work on every surface in your home, is totally safe around children and costs less than $1 to fill a spray bottle. ENTER YOUR INFORMATION, make sure and write down your login info so you can place a "quick order" at any time. Or to change your Essential Rewards order each month. CHOOSE SHIPPING, we highly suggest something higher than USPS, if you are impatient like we are and want it faster. Access to Oil Fun Club Members-Only Facebook group where we post fun giveaways, post educational material and hang out! Essential Oil E-Course that walks you through how to get started using oils in everyday life. 10-Day Starter Kit Challenge Digital Download! With well over 100 uses, this kit covers all of your basic household and personal needs. From stress, deep sleep, muscle support, skin support, focus, immune support, emotional support, ph balancing, cell regenerating, cell repair and food and water flavoring. You get 12 of the most popular oils for daily use, a medical-grade diffuser, Ningxia and Thieves Cleaner sample. 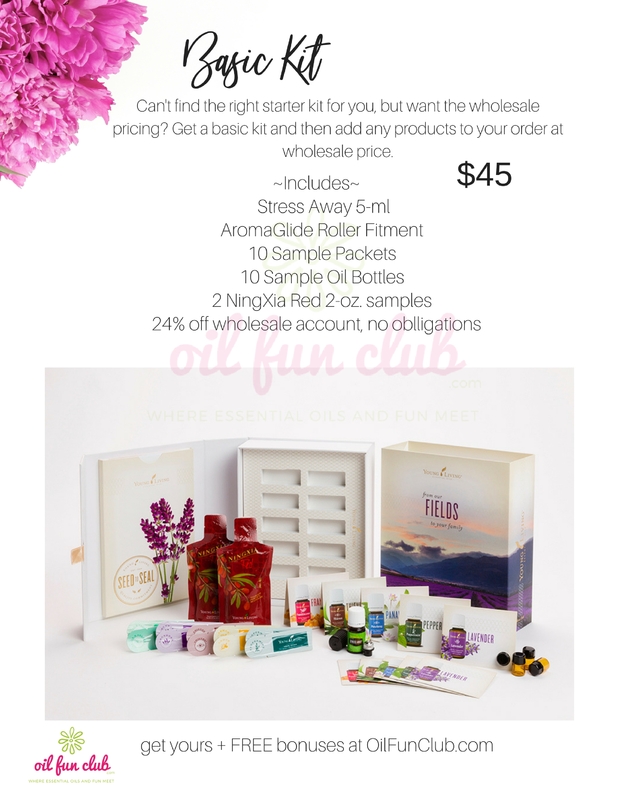 With the kit, you get a wholesale membership, 24% off Young Living's over 500 products, including household cleaning supplies, supplements, pet care, kids care, and much more. You also get access to our large Facebook community, regular tips and recipes, and a welcome gift from us. If you have not taken a crash course in essential oils, learn more about these oils here. Easily replace every toxic household cleaning solution in your house with this all-in-one natural cleaning kit. Plant-based formula infused with immune supportive oils (no synthetic fillers, no pesticides and non-GMO essential oils). Make an entire bottle of All-Purpose Household cleaner for under $1! Plus Thieves oil to start supporting your family's immune system right away. Every kit purchase comes with a wholesale account, 24% off any of Young Living's over 500 healthy home products. 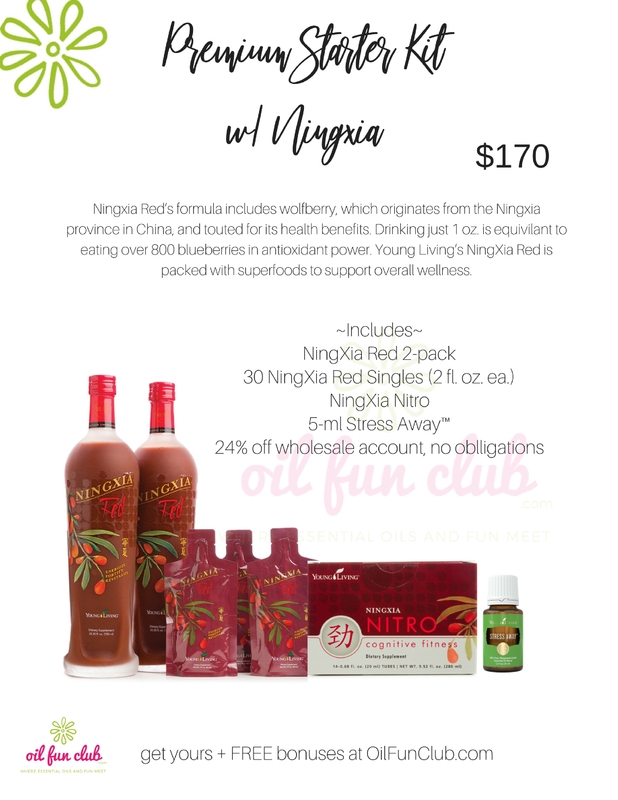 Ningxia Red’s formula includes wolfberry, which originates from the Ningxia province in China, and touted for its health benefits. Drinking just 1 oz. is equivilant to eating over 800 blueberries in antioxidant power. Young Living’s NingXia Red is packed with superfoods to support overall wellness. Treat children to this tasty drink instead of sugary sodas or juice cocktails. Women apply over 300 chemicals to their face and skin per day, including talc, bismuth, parabens, lead, mercury, and mineral oil. These chemicals are all found in store bought skin care and makeup products, which can disrupt the endocrine system (Hormones), are highly carcinogenic, and have even been found in tumors. Savvy Minerals is a safe alternative to toxic makeup lines and works beautifully. Not only will you look amazing, but your skin will be getting vital minerals to improve your skin. Want to customize your own order with wholesale pricing? Grab the basic starter kit and add on the products you want. You'll need a kit to start your oil journey. Quiz: Take the 10 question quiz to find out what oils YOU need!